A while back, I was looking into the question of what the home-field advantage is in basketball. This was related to an attempt to perform quantitative analysis on data sets as part of a project. The question that I wanted to answer was what is the home-field advantage in basketball, and does the advantage change based on distance. In order to test this theory that home-field advantage is related to the distance tween the two teams, I started off by acquiring roughly 15 years of basketball statistics. (This in itself is a complicated thing to do. I remain somewhat convinced that formatting errors in the publicly available sources might be purposely injected in order to dissuade people like me from doing this.) After acquiring the statistics for the scores of all games, I plugged in the GPS coordinates for each teams home-field and proceeded to calculate the distance that the visiting team traveled in order to get to the location. 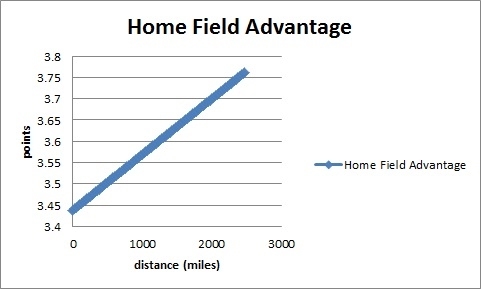 What I found was that the home-field advantage increased based on the distance that the visiting team had to travel in order to get to the location. Specifically, I found the following formula fit the curve. Besides a linear formula, I also attempted other quadratic approximations to match the data. For the distance ranges involved in US basketball games, higher order terms did not significantly impact the result. The distance formulas that I used were based on "how the crow flies", and therefore had a non-exact result. Additionally, my mechanism for translating GPS coordinates to distance was imprecise in relation to how the distance between degrees longitude changes based on latitude. In the interest of simplicity, I averaged the value based on the median value for travel within the US. There are some interesting follow-on questions that could be answered related to this work. The one that appeals to me most is the question of "did the impact of increased distance change over time?" This follow-on question could provide some interesting information regarding the quality of long-distance travel in America over time. For example, seeing a increase in the distance cost for travel to the visiting team after 'September 11th, 2001' would probably point to a indicator that home-field advantage as it relates to distance might be a means of measuring impact of travel on individuals. In general, I would hope that the distance aspect of home-field advantage has been decreasing over time. However, I currently have no facts related to this line of questions.